The British Museum set up a dedicated team in 1979 with the ultimate aim of creating a catalogue record for every registered object in its collections. 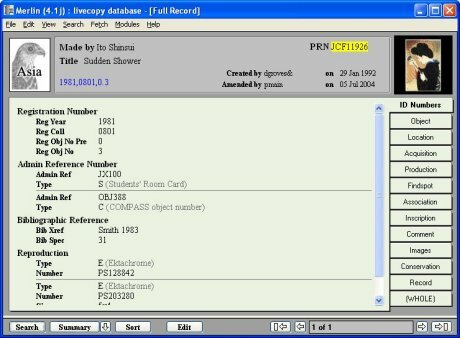 In 2002 the British Museum went live with the biggest collections management system in the world to date - a system that is still growing. We implemented and completed the work configuring the Merlin collections management system based on MUSIMS. Data was imported from the previous legacy system and the data structures and procedures were upgraded in line with modern and international museum standards. The Terminology Client includes thesauri developed by the British Museum and other international standards. The Unicode facility enables the museum to catalogue and search using historical and non-European scripts. Merlin, based on international standards and open systems technology, will support the British Museum's requirements well into the future for cataloguing and managing its collections and for making its collections accessible for secure scholarly access and for public access. The museum's collections are huge and variable in nature - information recorded about a prehistoric flint artifact is very different from a twentieth century drawing. Merlin has been configured to provide generic data/editing screens for each of the museum's departments and importantly to share a core set of fields which allow cross departmental searching of the database. In September 2002, British Museum staff completed cataloguing five of the (then) ten collecting departments of the British Museum - equivalent to a staggering 1.3 million records representing 2.5 million objects from the estimated 6 million registered objects in total. The Merlin system currently manages in excess of 1.7 million records and continues to grow. Work will continue for many years to come to complete the records. Merlin provides data and resources that are used in the museum's public access systems.